Streamlines communication to improve timeliness. Reduces errors common with paper forms. Uses a standard industry format for all participating states. Sends notifications faster, allowing more time to gather information. Allows employers and TPAs to upload supporting documentation. Saves time, administrative costs, and mailing expenses. SIDES E-Response is designed for employers and TPAs with a lower volume of UI claims and does not require any special programming or software. SIDES Web Service is designed for employers and TPAs with a higher volume of UI claims or those who operate in multiple states. This option requires the employer or TPA to do programming. For additional information on these options please visit http://info.uisides.org. 1. Which is best for me; SIDES or E Response? E Response is best for most employers. You simply login to the SIDES website – no IT intervention is required. SIDES requires IT product building to connect to your company infrastructure. This is generally used by Third Party Administrators processing a large volume of employers. If you are not sure which is best, you can begin with E Response & decide after use if you would prefer to do the additional IT work necessary to switch to SIDES. 2. How do I sign up for E Response? You can either call 866-239-0843 or send an e-mail to IWD-SIDESINFO@iwd.iowa.gov. Federal Employer Identification Number (FEIN): 9 digit Federal Account number. State Employer Identification Number (SEIN): Iowa employer account number - a 6 digit number with a 3 digit location code. Contact E-mail address(s): E-mail address where IWD will send notification that Notice of Claim records have been posted to your account. Recommendation: If possible, use a group or generic e-mail such as ‘groupaddress@companyname.org’ that can reach multiple staff rather than listing the individual e-mail addresses for each staff member. CSR explains to the employer that a letter will be mailed out to the address on file with a Personal Identification Number (PIN). The instructions will tell them to send an e-mail to IWD-SIDESINFO@iwd.iowa.gov after they receive the PIN to activate their account. The account will be set up and a return e-mail will be sent to let the employer know. 3. What happens once I request to sign up? IWD will mail a PIN letter to you. When you receive the PIN letter you send an e-mail to IWDSIDESINFO@iwd.iowa.gov letting us know you have received it. At that time the account is set up and a return e-mail is sent letting you know. 4. How will I know that I have claim records to review? An e-mail with login instructions will be sent to you each day that an item is posted to your account. 5. How do I login to E Response? Once you click this link, you will see a login screen. 6. I am getting an error message when I try to login. You will not be able to login if there are no records posted to your account. Any items that have previously been posted will drop off after 35 days. 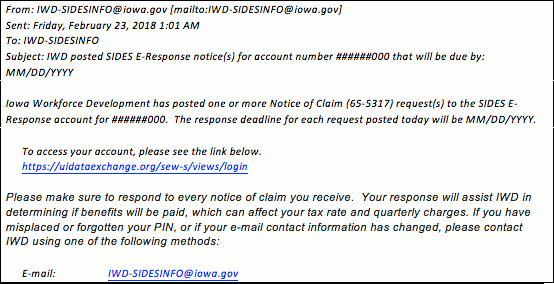 If you have entered the information correctly after the 1 hour wait, and are still unable to login, please send an e-mail to IWD-SIDESINFO@iwd.iowa.gov. 7. Can we have more than one PIN? Only 1 PIN can be assigned for each SEIN/FEIN. Multiple users may log in using the same credentials, however only one person can open a particular claim at a time. 8. What do I do if I forgot/misplaced my PIN? Please send an e-mail to IWD-SIDESINFO@iwd.iowa.gov or call 866-239-0843. Please include or have ready your FEIN, SEIN, email and phone number. If your account has been verified the CSR will be able to give you the PIN over the phone. If the information cannot be verified we will send the PIN letter through the mail. It will be sent to the address on file. 9. What if our PIN has been compromised & we need a new PIN? Please send an e-mail to IWD-SIDESINFO@iwd.iowa.gov or call 866-239-0843 include or have ready your FEIN, SEIN and the e-mail address on file. After the account is verified a letter will be mailed to the address on file with the new PIN. When you receive the PIN letter you will send an e-mail to IWDSIDESINFO@iwd.iowa.gov letting us know so we can make the change. Once the account has been updated a return e-mail will be sent letting you know you may start using the new PIN. 10. How many e-mail addresses can be assigned to my account? We can add multiple e-mail addresses to the account. You will be required to notify us if any of these e-mails should be changed or removed. We recommend a ‘group’ e-mail so you can define the recipients. 11. How do I change/update my E-mail contact information? You may also call 866-239-0843. After the information has been verified – the change will be made. 12. I have already signed up for SIDES in another state. Do I have to sign up in Iowa too? Each state handles SIDES participation individually. You will be required to have login credentials in each state. 13. How can I contact other states? 14. Can you stop sending me flyers inviting me to sign up? 15. How can I cancel my SIDES Participation? If you decide at any time to discontinue your participation in E Response & return to paper notice of claims, a request must be submitted by an authorized representative of the company to IWD-SIDESINFO@iwd.iowa.gov. Any requests of this nature will be verified before deactivating E Response. 16. I am logged in to E Response, but I need help answering the questions. 17. I am logged in to E response, but I am getting error messages when I try to submit my response.